Senior guard David Crisp is neither making excuses nor leaving anything to chance with just a few months of basketball left in his college career. He's willing to do whatever is necessary to get the Huskies to the NCAA tournament. The clock is ticking and David Crisp can feel the time expiring on his college basketball career. Maybe that’s why the Washington Husky senior has been barking at the young guys in practice recently and not allowing anyone to slack off. He’s not leaving anything to chance. Not anymore. Approaching the end of a UW career that feels incomplete without a NCAA tournament appearance has created a sense of urgency that possibly explains why the 6-foot guard has been on fire of late. In the past three games Crisp has hit 12 of 18 three-pointers, including four at Colorado, five at Utah and three against Washington State. Crisp has had hot shooting streaks before. Two years ago, he made 15 of 27 from long range during a four-game stretch. But his latest streak has drawn Steph Curry comparisons. With Crisp averaging a team-high 18.7 points against Pac-12 teams, the Huskies (12-4, 3-0) are off to their best conference start since 2015-16. Thursday’s 6 p.m. matchup against Stanford (8-8, 1-3) will be a chance for Washington to extend its five-game winning streak and perfect 8-0 record at Alaska Airlines Arena. It’s also another opportunity for Crisp to continue his historic assault on the record books. He’s the first UW player to record at least 1,000 points, 300 assists, 200 three-pointers and 100 steals. Last Saturday, Crisp converted 4 of 7 three-point tries at Utah. Two days earlier, he hit 5 of 7 from downtown at Colorado. For the season, Crisp is shooting 38.2 percent on three-pointers, which is a 9.6 percent improvement from last season when he shot a career-low 28.6 percent behind the arc. 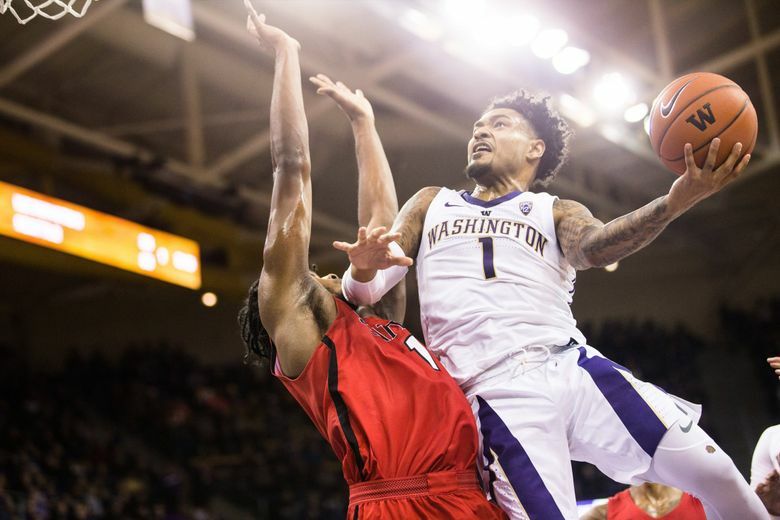 While struggling to find consistency with his outside shot, Crisp became a target for UW fans who also bemoaned an erratic playmaker that averaged 3.1 assists and 2.4 turnovers. He tried avoiding the critics without success. “It’s 2019,” he said laughing. “You hear things. You see things. Even if you’re not a big social media guy, things pop up on your timeline or in your mentions and you have to deal with it. Crisp recently revealed that he played the first half of the 2017-18 season with lower back pain comparable to a bulging disc. Midway through last season, Crisp developed a fissure in his left knee and held off treatment until after the season. “I couldn’t get any lift on my jump shot,” he said. “But you never make any excuses no mater what. I wasn’t going to sit out and let the guys down. I felt like I was still good enough to contribute. Even when it seemed unwarranted, coach Mike Hopkins has been Crisp’s biggest supporter. “Coach Hop tries to be like my protector,” Crisp said. “He always has my back and he’s always defending me through whatever. The ultimate thing is nobody knows what goes on behind closed doors. Hopkins needed Crisp to play a team-high 34.2 minutes last season because of the lack of depth at point guard. This season, Crisp is down to 32.5 minutes because of Nowell’s ascension as a playmaker. Crisp is taking fewer shots (10.4 to 8.8), while his field-goal shooting percentage has improved to a career-best 41.4 percent. “He’s our emotional heartbeat,” Hopkins said. “He’s the guy who’s been diving on the floor. He takes a charge in transition. He gets those long rebounds on the weakside. He loves the moment. But it’s his energy that’s infectious to me.